Gather round friends. It’s time for my Annual Valentines Story. Embarrassing, but too good not to share once again! To Lance’s credit, he got cleaned up pretty quickly—to my surprise he strolled in 15 minutes later in a plum colored Miami Vice suit. Hot! We shared an awkward dance to Union of the Snake by Duran Duran and then got in line to get our picture taken. Bear in mind I’m totally NOT dressed up and look like a huge dork. Not to mention the photography set up was sooo low budget—it was literally a chair next to a tall skinny table with a rose on it. Lance thanks me and immediately leaves after getting our pic taken. So much for our “date”. I trot back to the table where Todd asks me “How was the dance?” I shoot him a look. I’m thinking, “What am I going to do with all these photos of me and Lance?” Cut to the end of the night. Our photographer comes over and says, “Hey, you two kids have been working so hard all night. How about a picture on the house? ?” Todd lights up. “Sure!” Good lord, so now I have to take another awkward wierd photo with ANOTHER non-date??? This was turning out to be the most random dance EVER. Two weeks later I was presented with not one, but TWO sets of photos. 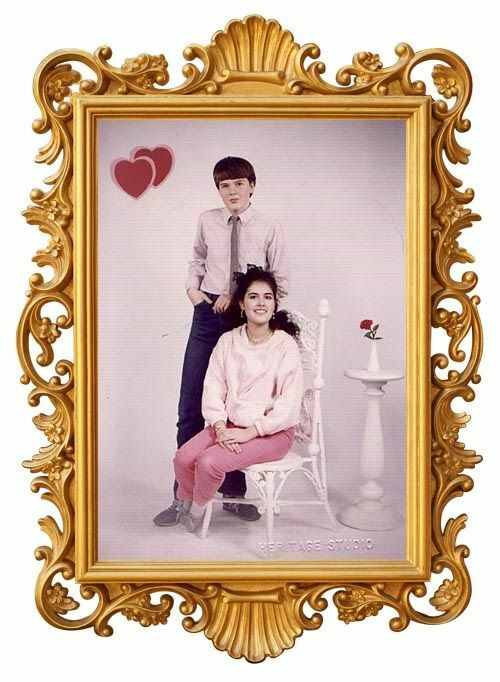 I was now the proud owner of multiple 5x7s and far too many wallet pics of the Valentines Dance… TWO different dates. Of course I handed them out to all my friends. “Would you like something from the Lance or Todd Collection?” I would offer. TODD. Rockin’ the high waisted jeans and running shoes. Goober chic. 6) On a positive note, I *am* wearing a lovely vintage rhinesone necklace. Which you can’t really see. But trust me. It’s perty. Can I get a few points for that?? This is me again. Slightly better photo. I was made fun of by my friends for YEARS afterwards. I had actually pushed the whole sordid affair back into the far corners of my mind, when I got a Valentine’s Day card from my friend Jennifer, who I had lost touch with. Inside were the two wallet sized pics of me—one with Lance and one with Todd. I couldn’t help it, a small tear welled up in my right eye. Not from nostaligia, but from the realization that I was wearing Madonna-style lace gloves, but ONLY in the picture with Lance. It’s true. Scroll back up if you don’t believe me. Happy Valentines Day, Kiddos. Eeeeeee! I love this post! And any guy that wanted to be like Prince. Cut yourself some slack. 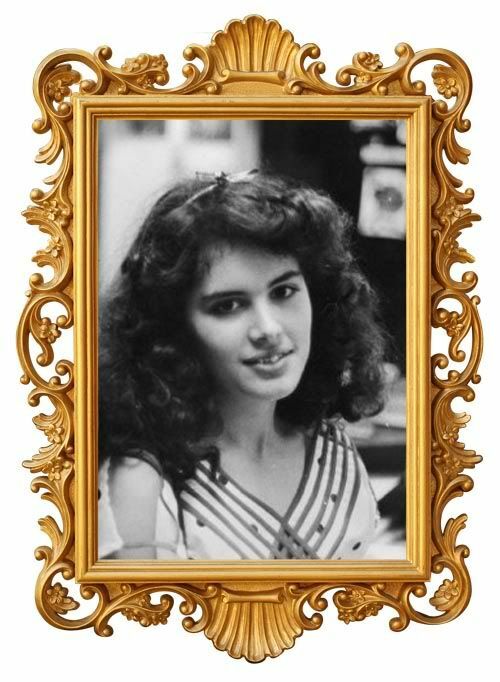 It was the 80’s. And trust me – you were the girl that I wished that I was dressed like. I would have never dared do the lace bow – not cool enough. Or the lace gloves. Maybe I will today. What happened to Todd and Lance? Oh geez, hahaha. You are too nice! Todd I was in touch with up through college (and could probably track him down) but I’m not sure what happened to Lance! Never, never will I get tired of this story!!!! And if anyone is interested: I believe there are still some of those pics in the basement of the Flint house! I really hope you look up Lance and Todd on Facebook one day! I think the lace gloves are very demure. And we are so buying some to wear for next year’s Alt! I was in touch with Todd up through college. Todd has a twin brother, Kevin btw…. thank you, not only did i chuckle my head off but i will now have union of the snake pumping in my brain with images of you and lance bopping like dags to it. lance scares me a bit with his confident Prince-y-ness, although having said that i totally adored Prince in the mid 80’s. todd seems nice, more your non threatening dungeons and dragons role playing dude at lunchtime kinda guy. i too wasnt brave enough to do the madonna lace in hair thing, although was brave enough for flouro orange baggy jumpers, and floral high top sneakers (before going goth!). can you do a part two to this story and find out what T&L are up to these days?! oooooh, now I need to see goth you. i was a quasi goth—not totally committed to it, but I’ve got some awesome pictures from the 90s I should bust out! The brassy gold frames just totally make the whole thing. Oh puhleez, you never looked like hell in your life. At least not when we were in school (after which I have no knowledge). Your outfit was what one wore in that situation. Jazz oxfords were da bomb! I love you so much — you made me yelp with “UNION OF THE SNAKE.” And I was actually admiring your pink sweatshirt!! !